Zsófia Psotta in WHITE GOD, a Magnolia Pictures release. Photo courtesy of Magnolia Pictures. 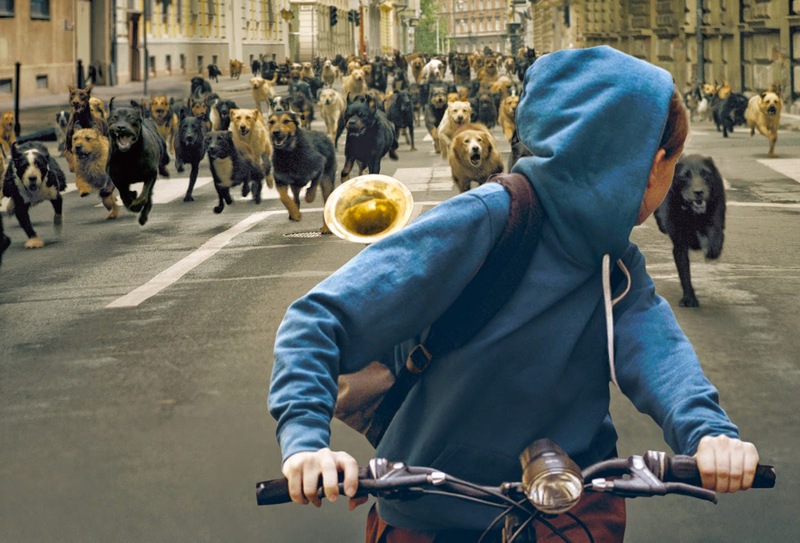 Kornél Mundruczó's brutal, disturbing, and powerfully original social allegory, White God (winner of the 2014 Cannes Film Festival's Un Certain Regard Award), is an ambitious piece of filmmaking that's a jaw-dropping cinematic achievement, and one of a number of films that have screened at New Directors/New Films this year that have pushed through traditional cinematic conventions. The Tribe pushed traditional language conventions by presenting the entire film in Sign Language without subtitles. Court is a courtroom film steeped in realism, not traditional courtroom drama theatrics. And White God tells much of its story through the eyes of a dog, showcasing some of the greatest canine performances ever put on film. White God tells the story of Hagen and Lili (Zsófia Psotta in a moving performance), a dog and his human best friend, respectively. When Lili goes to live with her father, she is forced to give up Hagen and set him loose on the streets. While on the streets, Hagen meets a band of outcast dogs and is abused by a number of people. Meanwhile, Lili goes to find Hagen. White God is formally brilliant and emotionally engaging, but it's also a powerful allegory for the struggle of the lowest classes of society. While Mundruczó's allegory has blunt force, it is handled with grace, and the subtlety with which Mundruczó handles the film's key moments (the final scene in particular) shows impressive directorial control. As much credit as Mundruczó deserves for creating this film, the film's animal trainer, Teresa Miller, deserves recognition as well for training the 100+ dogs featured in the film. The film largely succeeds due to her work. Overall, White God is a visceral, ruthlessly intelligent piece of filmmaking. Humane, unflinching, and terrifying in equal measure, this is not going to be a film for everyone, but for those who can make it through, it will be an unforgettable experience. At its heart, White God is the story of a girl and her best friend and Mundruczó never forgets that, giving the film a beating heart that shines through and leaves more of a lasting impression than all of the violence and cruelty.